Are your students making sufficient progress to meet standard by June? How is "Suzie's" progress compared to the others in her group? Is your math program effective? Using data to drive your instructional decisions is at the heart of effective teaching. 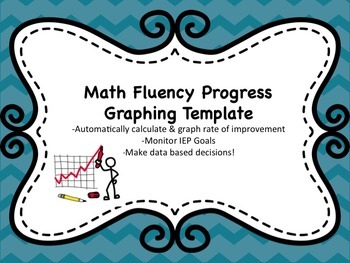 This template quickly and easily turn raw math fluency data into usable information to make data based decisions. This editable Excel Spreadsheet creates visual reports that answer those tough questions and develop a plan to meet the needs of each student. Student's math fluency scores vary from day to day. By calculating a trend line you can measure the overall rate of improvement and compare it to the aim line they need to improve their beginning score to their goal score. 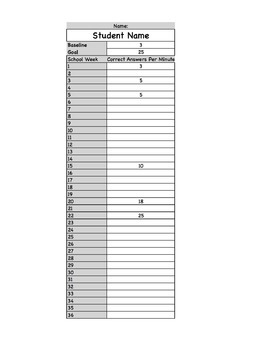 This is not just a printable It is a fully functional Excel spreadsheet that automatically calculates student rate of improvement (ROI) and predicted end-of-year fluency rate based on baseline fluency data, goal, and progress monitoring scores. 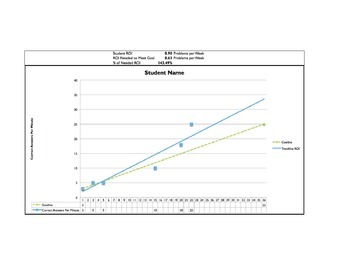 Accurate trend line predicts if the student will meet their math fluency goal by year end. 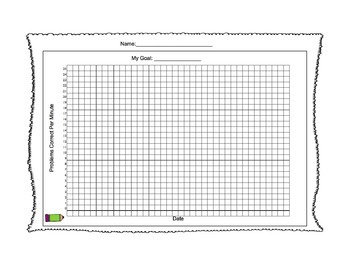 This graph can be used to create a clear visual of student performance against benchmark and/or IEP goals.